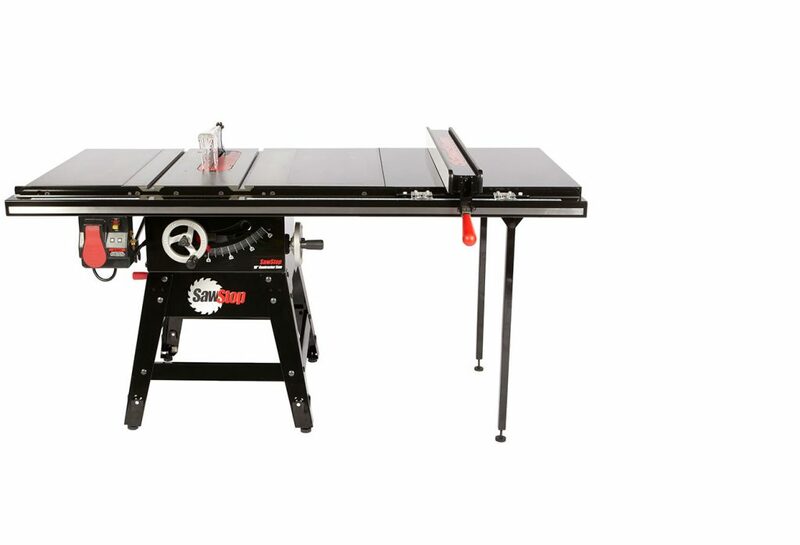 Choosing a table saw for a home shop can be frustrating. Especially for the more advanced home shop. While I can’t tell you which saw will be best for you, I can help you decide for yourself. 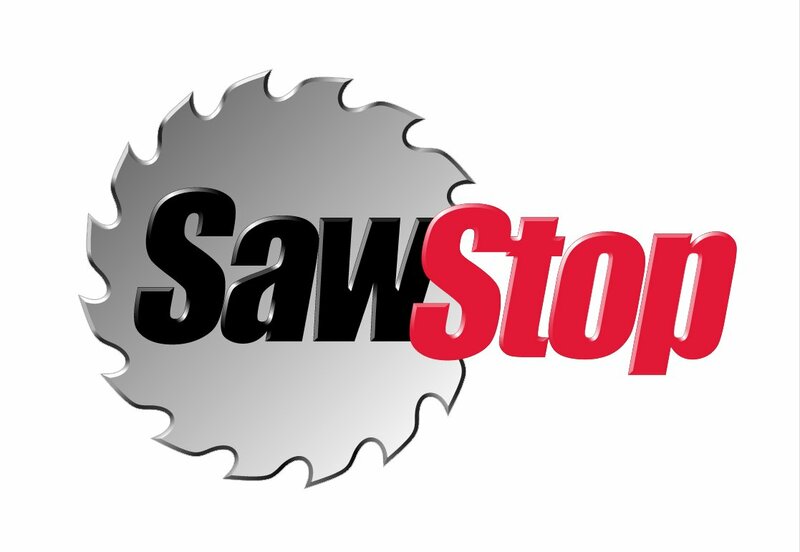 I want to discuss the differences between the SawStop Contractor Saw (CNS175) and the SawStop Professional Saw (PCS175 and PCS31230). I’m going to take the approach of looking at what may be important to you and address them in turn. If I have failed to cover something that you consider important please let me know in the comments below and I will update this article. 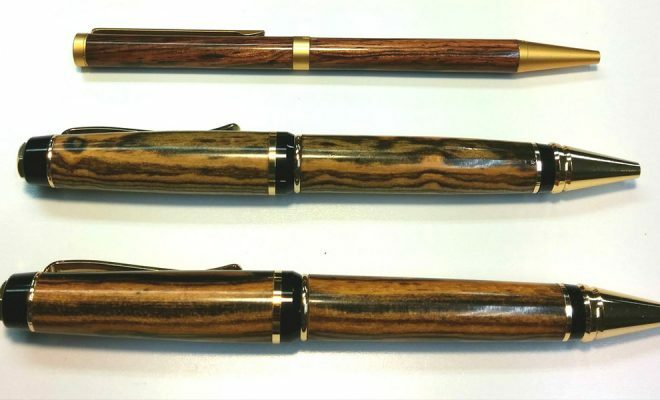 Keep in mind that this particular article is only discussing the differences between the CNS and the PCS saws. I will write separate articles discussing the JobSite Saw (JSS) and the Industrial Saw (ICS). 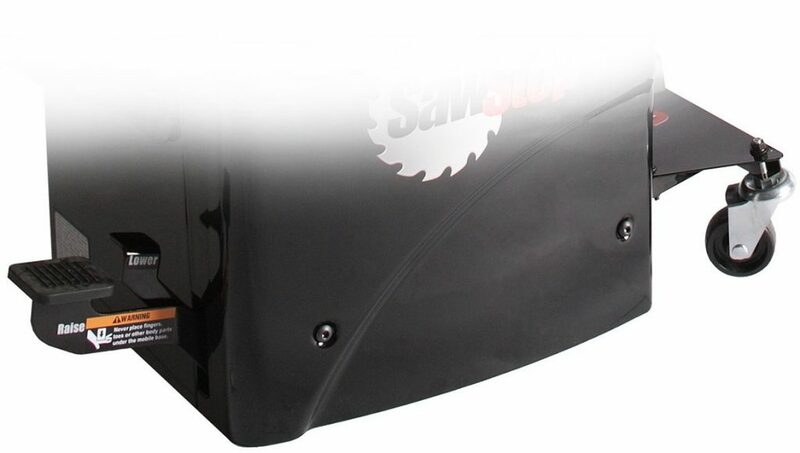 SawStop is currently running a promotion for anyone who buys a PCS175 or PCS31230 between March 1st, 2019 and April 30th, 2019. You can choose from either a PCS Integrated Mobile Base or the Overarm Dust Collection system. If you buy a PCS175 and want to get the Overarm Dust Collection system, you will still need to purchase the Dust-Collecting Blade Guard separately. This promotion is valid for all PCS saws purchased between the above dates, whether you buy your saw online or from a brick-and-mortar store. With that said, let’s get started with the details. 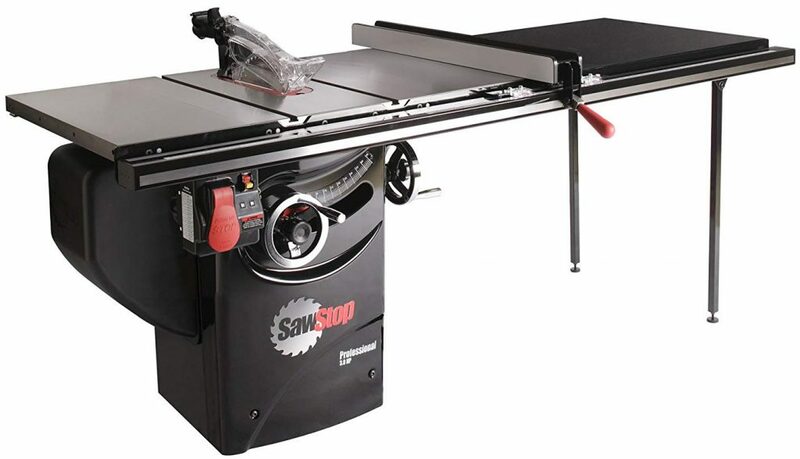 All SawStop saws can be made portable to a certain degree. The ultimate in portability is the JobSite Saw, but in the early days before SawStop made the JobSite Saw, the Contractor Saw was the go-to option for portability. The CNS has two mobility options: the Mobile Base and the Mobile Cart. The CNS Mobile Base uses two fixed and two swivel casters to move the saw around. There is a weight limit with this mobile base so adding accessories such as a cast-iron router table may not be an option. Easy to maneuver compared to some other mobile bases. Four wheels are very stable compared to three-wheel mobile bases by other manufacturers. Assembly can be difficult for some. Two fixed casters are typical with most mobile bases but not as easy to maneuver as a mobile base with four swivel casters. Doesn’t lift optional outfeed table. Weight limits can make certain accessories technically incompatible. The CNS Mobile Cart uses two 10” solid rubber tires and two fixed feet. It moves much like a wheelbarrow and works on rougher terrain, such as what you would find at a job site. Designed to be fit through a standard doorway when the motor is removed. Only compatible with the 30” or 36” fence system, not the 52”. The PCS has two mobility options: the Integrated Mobile Base and the Industrial Mobile Base with PCS Conversion Kit. The Integrated Mobile Base is very similar to the CNS mobile base in that it uses two fixed and two swivel casters. It shares the same pros and cons as the CNS Mobile Base as well. Now we’re getting serious! The Industrial Mobile Base uses four swivel casters which allow you to spin your saw in place. It was designed for the Industrial Saw which weighs almost twice as much as the Professional Saw so it can handle the weight of pretty much any accessory you can throw at it. It requires you to purchase and install the PCS Conversion Kit which modifies the Industrial Mobile Base to work with the slightly smaller PCS. Note: The link above contains both the mobile base and the conversion kit. Extremely easy to finely position your saw anywhere in your shop. Strong enough to lift the PCS and any accessory attached to it. PCS Conversion Kit requires removal of screws with blue Loc-Tite on them, which can be difficult. Will cause you to despise all other mobile bases you ever use. Both the CNS and the PCS have cast-iron main tabletops. The CNS comes stock with a stamped steel 12″ extension wing on each side of the main table. 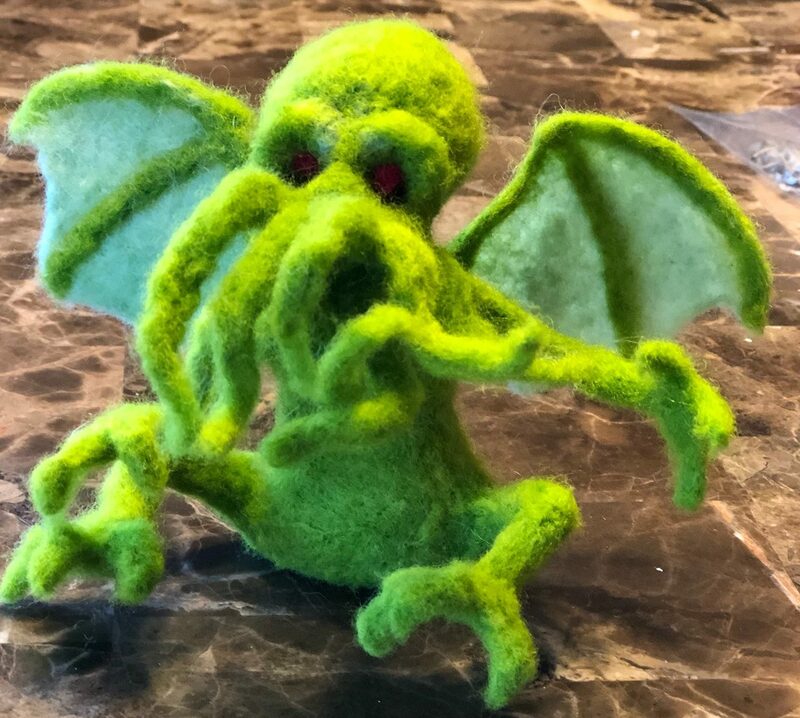 This is because the CNS is designed to be portable and the stamped steel wings weigh quite a bit less than the cast iron wings that come standard with the PCS. You have the option of adding the cast-iron extension wings to the CNS which increases the weight of the saw, resulting in less vibration. Both the CNS and the PCS are available in a 30”, 36”, and 52” fence configurations. The 30” Standard Fence Assembly for the CNS is a lightweight aluminum fence system that secures at both the front and the back of the saw. Because of this, some accessories are not compatible with the 30” fence system. The 30” Premium Fence Assembly for the PCS is similar to a Biesemeyer style fence that you find on larger cabinet saws. It secures to the front rail only. The faceplates for the PFA are non-replaceable. Both the 36” and 52” fence systems use a larger, more heavy-duty Biesemeyer style fence. It has replaceable faceplates. Although the name has “Professional” in it, this system is also completely compatible with the CNS. The miter gauge for the Contractor Saw is similar to the one provided with the Professional Saw but there is one minor difference. 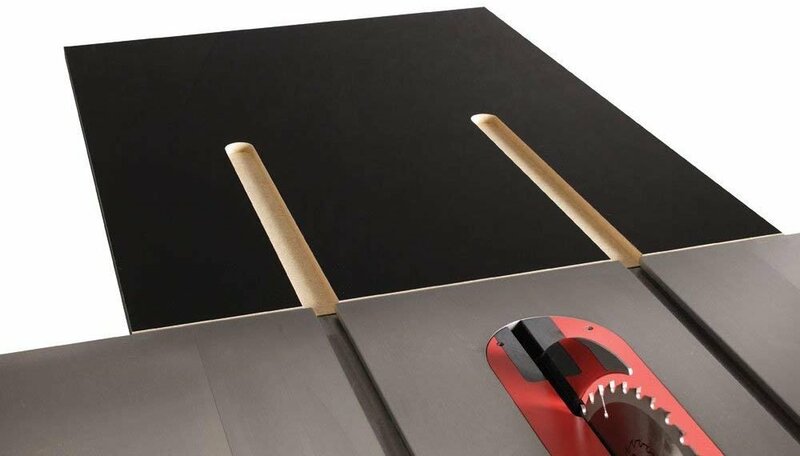 The miter gauge for the Professional Saw has spring bearings on the side of the miter bar that work to ensure the miter gauge is always held firmly in the slot without any play to it. The miter gauge for the PCS (above) and the CNS (below). Note the addition of spring bearings on the side of the miter bar for the PCS miter gauge. The amount of space that each saw takes up can be misleading. 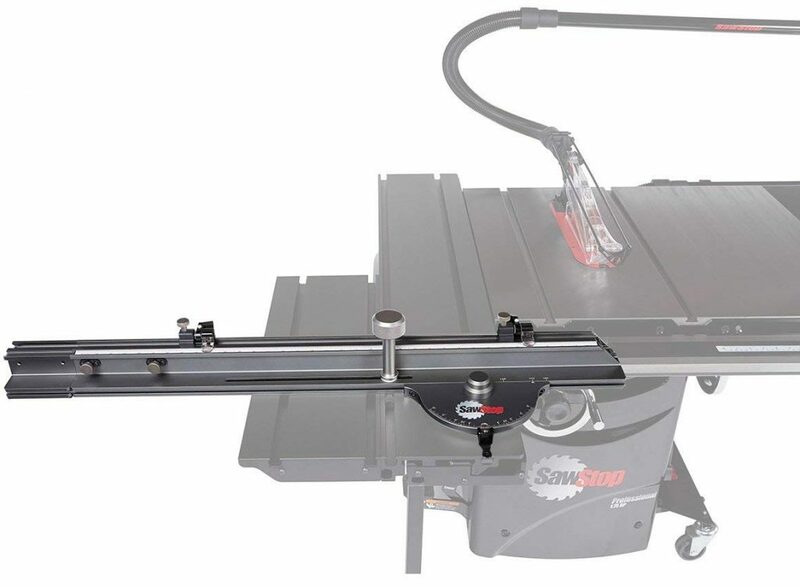 While both the CNS and the PCS saws share the same table dimensions, the CNS has a motor that hangs off the back of the saw which adds to the amount of space that it takes up. A few things to keep in mind: the height of the Contractor Saw is adjustable since it has screw-in feet at the bottom of each leg; the industrial mobile base adds an additional ¼ ” to the height of the saw. The Professional Saw is available in either 1.75 HP at 110 or 220 VAC, or 3 HP at 220 VAC only. If you’re going with the Contractor saw then you are pretty much limiting yourself to 1.75 HP, which may not necessarily be a bad thing. The Professional saw, however, adds the possibility of moving up to 3 HP. This can be done when you initially acquire your saw by purchasing the PCS31230 or it can be done at a later date by purchasing a PCS175 then buying a new motor and contactor box when you decide to do the upgrade. This option is more expensive than just buying the PCS31230. Is 3 HP necessary? Not necessarily. I’ve used 1.75 HP saws for years without any problems, you just need to know how to work within those limitations. If you’re making cabinets and spend the bulk of your time cutting sheet goods, a 1.75 HP machine should be fine. If you need to cut the occasional hardwood then it helps to switch to a thin blade with fewer teeth, or simply lower your feed rate but that can cause burning on your material. One trick that I have done in the past is to cut my material just a hair wider than I need it at a slower feed rate. This will cause some burning but won’t over-tax the motor. Then, I move my fence over and cut the material to the final width at a normal feed rate so I’m not removing much material but going fast enough to help minimize any burning. That being said, it is really hard to bog down a 3 HP motor. Both the CNS and the PCS175 come wired to 110 VAC but can be upgraded by purchasing an optional 220 VAC contactor box and changing the wiring in the motor junction box. The 3 HP PCS31230 is only available in 220 VAC. One question I get asked a lot is what are the advantages of going from 110 VAC to 220 VAC. The bottom-line is no, you won’t see an increase in power. There are some other advantages, however. A 1.75 HP motor running on 110 VAC will have an amperage load draw of 13 Amps. This means that under load, the saw will require an average of 13 amps to keep the motor spinning at speed. If you bog down the motor by cutting dense wood, the motor draws more amps to keep spinning at speed. If you are pulling 13 Amps on a 15 Amp circuit then you don’t have much headroom before the breaker is tripped. A 1.75 HP motor running on 220 VAC will have an amperage load draw of 10 Amps. This causes the motor to run cooler, which is better for the motor in the long-run, but also gives you more headroom before the breaker is tripped. This comes in handy when resawing dense hardwood or anything else that really pushes the motor. Both 220 contactor boxes come equipped with a Nema 6-15 plug. 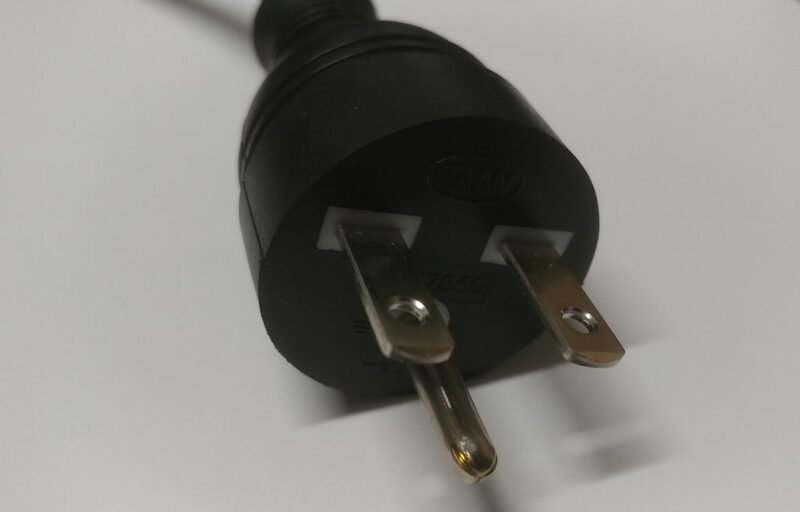 This means that it is a style 6 plug rated for 15 amps. You should be able to run the saw on a 15 Amp circuit without any problems. Most people run these saws on a 20 Amp breaker. A standard airflow requirement for most table saws is 350 CFM in order to provide decent dust collection. 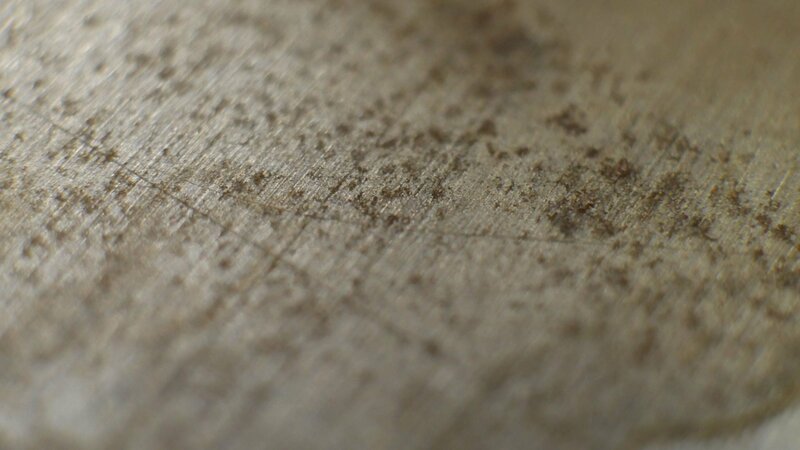 By design, any cabinet saw should have better dust-collection than a contractor saw. Cabinet saws are enclosed so the sawdust that doesn’t make it down the dust chute will still be contained within the body of the saw. Contractor saws, on the other hand, are much more open so loose sawdust will fall to the floor under and around the saw. 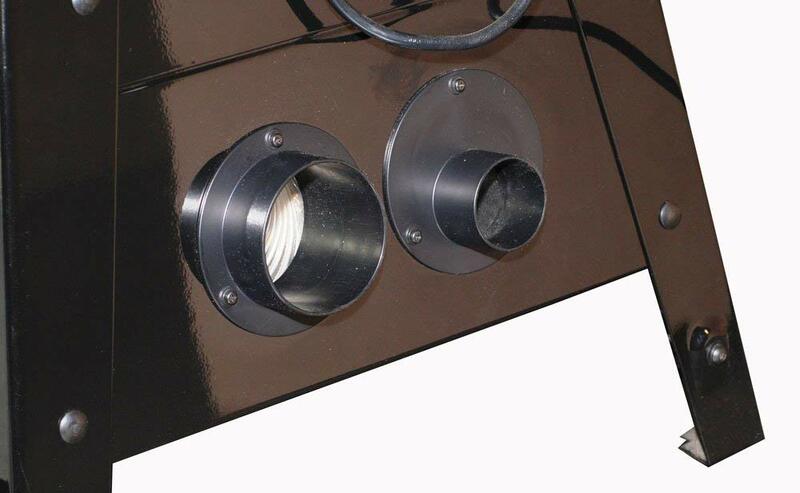 The Contractor Saw has an optional accessory called the Dust Collection Panel (CNS-DCP) which allows you to hook up either a 4” or a 2 ½” hose to the back of the saw, while making the connection point much more accessible. The 2 ½” port enables the use of a Shop-Vac rather than a dust collector. While Shop-Vacs do not generally provide the required CFM, they’re better than nothing. The Contractor Saw and the PCS175 both come with the Micro Blade Guard (TSG-MG). The advantage of the Micro Blade Guard is that the clear plastic shell can be easily removed which allows you to use a splitter with anti-kickback pawls. The Contractor Saw and the Professional Saw share a lot of the same characteristics. As such, they share a lot of the same accessories. While the 30” fence options are different for each saw, the 36” and 52” T-Glide fence system is completely identical for both saws. The table depth is 27” on both saws, so the cast-iron wings for one saw will technically fit on the other one although they are slightly different in a superficial way. This also means that the inline router table will technically work on both saws although it isn’t officially supported on the Contractor Saw. More on this in a bit. Let’s address all of the accessories in turn. First, here’s a checklist of each accessory and it’s compatibility with each saw. 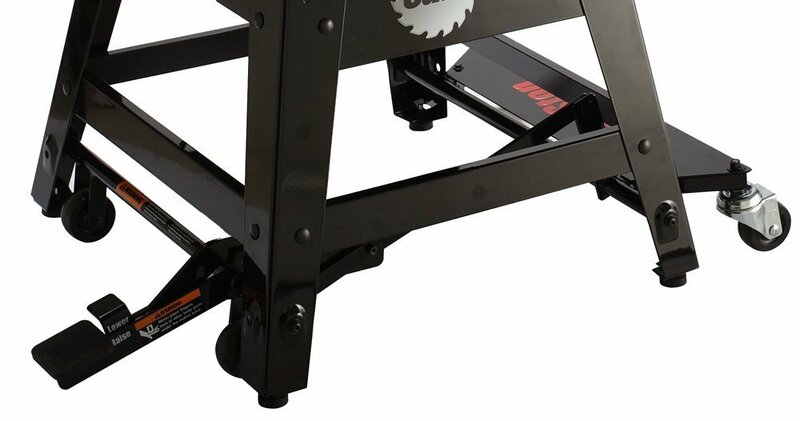 The Contractor Saw Mobile Base allows you to move the Contractor saw around your shop easily but it’s not designed to lift extremely heavy loads. 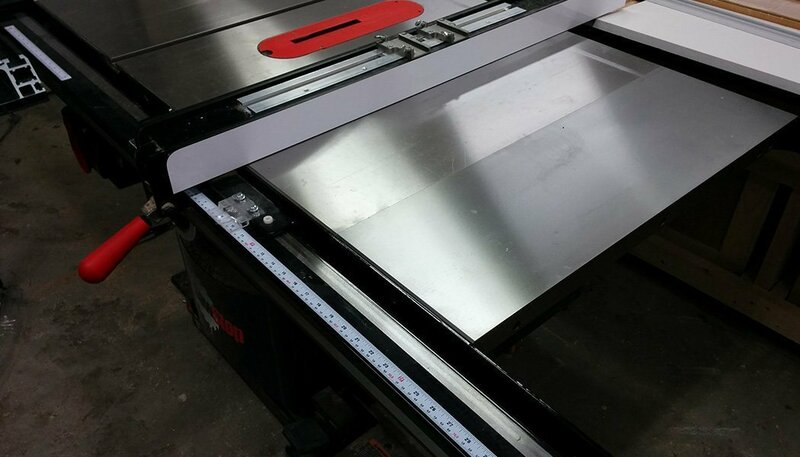 This limits the compatibility with some accessories such as the router table and the sliding crosscut tables. This mobile base features two fixed and two swivel casters, similar to most mobile bases on the market. The Contractor Saw Mobile Cart makes the Contractor saw extremely portable. 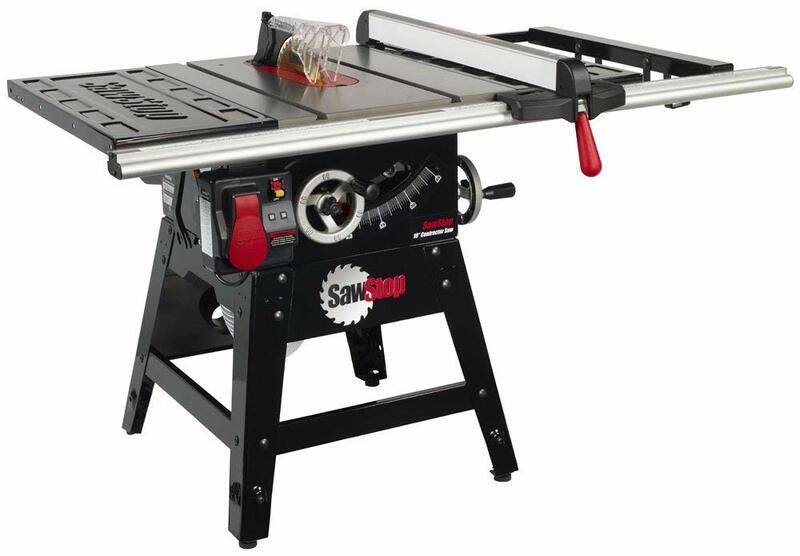 If you team this up with the 30″ SFA fence system and the stock stamped steel wings then the saw is relatively lightweight and easy to maneuver. It should be noted that the mobile cart is technically not compatible with the 52″ fence system, simply because it is so long that it will stick out over the cart handle. The Professional Saw Integrated Mobile Base is much like the Contractor Saw Mobile base in that it has two fixed casters and two swivel casters It also has a weight limit that makes some accessories technically incompatible with it since it may not support the weight. *I have an ICS (which weighs almost twice as much as the PCS) with an extra cast-iron wing, the TSG-FDC Floating Dust Guard, and the Inline Router Table attached to it and the mobile base lifts the entire thing up without even the slightest hesitation. 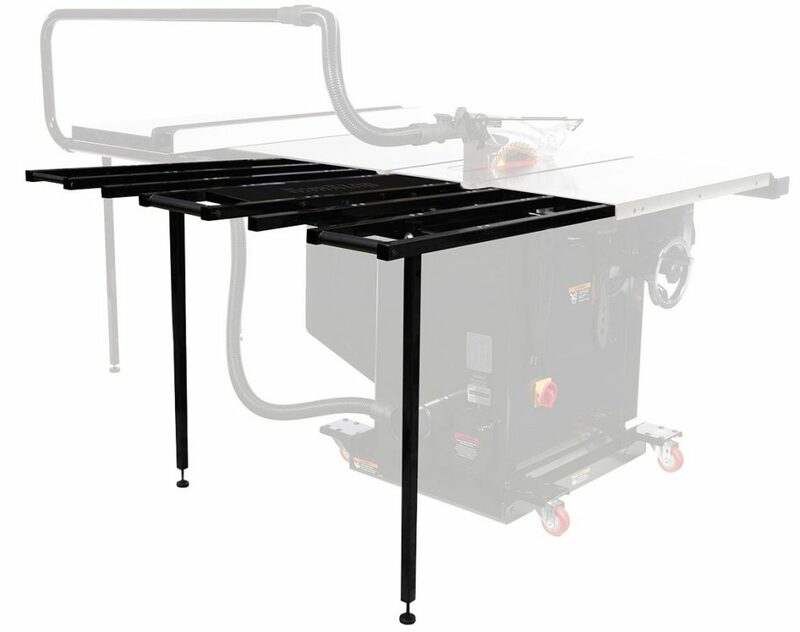 The 30″ Outfeed Table is a quick, easy way of adding outfeed support to your saw. This was designed for the Contractor Saw but is perfectly compatible with the PCS as well. 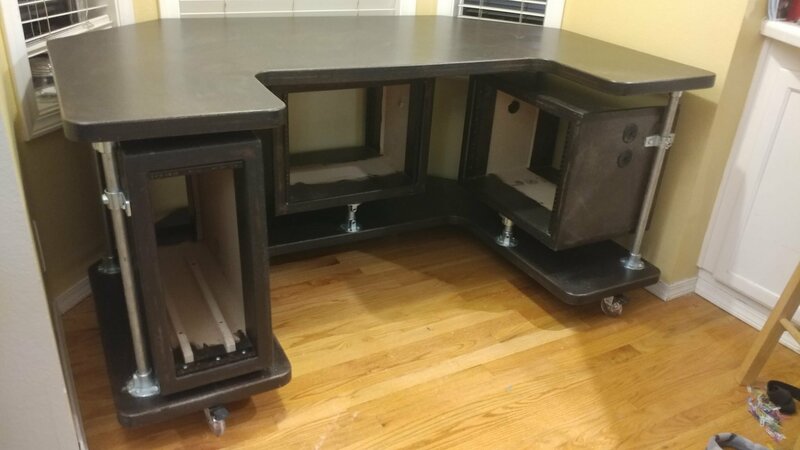 It should be noted that the 30″ Outfeed Table is not compatible with a mobile base because there isn’t anything to support the legs for the outfeed table. That being said, I am proud to include myself in the large group of people that have jury-rigged and modified it so that it works fine with a mobile base. You just need to get creative. The Folding Outfeed Table provides a large outfeed surface while being portable and compatible with both mobile bases. It also, as the name implies, folds down out of your way when not needed. 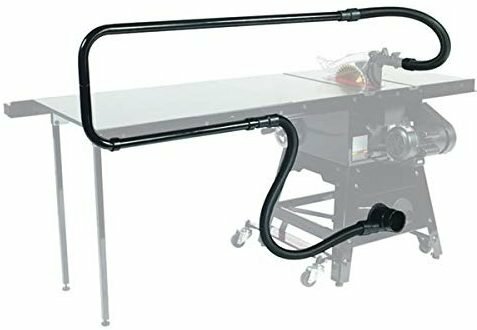 The Folding Outfeed Table is not compatible with the CNS for two reasons. 1. The motor will get in the way. 2. The motor will hit the Folding Outfeed Table when the blade is angled past 40-degrees. Normally you would hook up a dust-collector hose to the underside of the contractor saw. This is fine if you plan on leaving it permanently hook up to the saw but if you are needing to remove it and reattach it to another saw or if you want the option of using a ShopVac with a 2 1/2″ hose then the Dust Collection Panel is a worthwhile upgrade. This item places both a 4″ and a 2 1/2″ dust port at the rear of the saw rather than underneath. 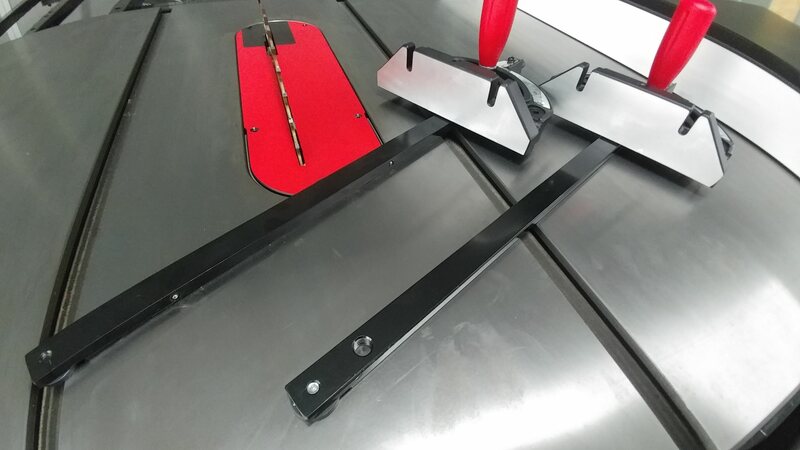 The TSA-ODC allows you to hook up the dust collecting blade guard (TSG-DC) to your saws existing 4″ dust port. The CNS175 and PCS175 come with the Micro Guard (TSG-MG) which does not have a dust port on it. 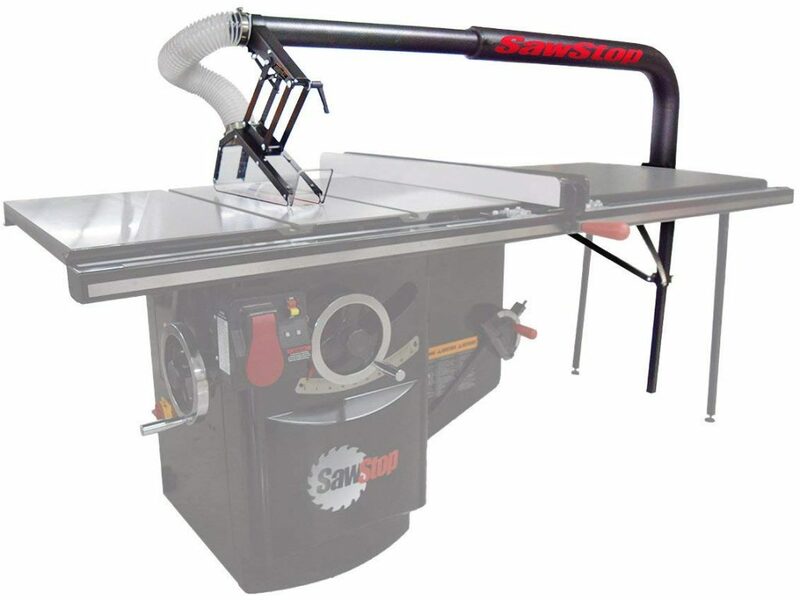 If you are wanting to install the TSG-DC on either of those saws then you will need to purchase the TSG-DC. Since the PCS31230 comes with the TSG-DC then there isn’t anything else that needs to be added. *With purchase of TSG-DC. Only compatible with the T-Glide fence system. The Floating Dust Guard (TSG-FDC) provides above-the-table dust collection while allowing you to use simply the riving knife or even no blade guard, such as when you are cutting dadoes. The 4″ port provides slightly improved dust collection over the TSA-ODC while increasing blade visibility. It also allows you to position the guard much closer to the blade so you can make thinner rip cuts while still using the blade guard. The TSG-FDC requires either the 36″ or 52″ T-Glide Fence System since it attaches to the far right end of the wooden extension table. Also, for the exact same reason, if attaching the TSG-FDC to a saw with a cast-iron router table attached, the router table will need to be attached to the left rather than the right. The TSG-FDC is technically not compatible with either the Contractor Saw Mobile Base or the Professional Saw Integrated Mobile Base due to weight limitations. It works fine with the Industrial Mobile Base. 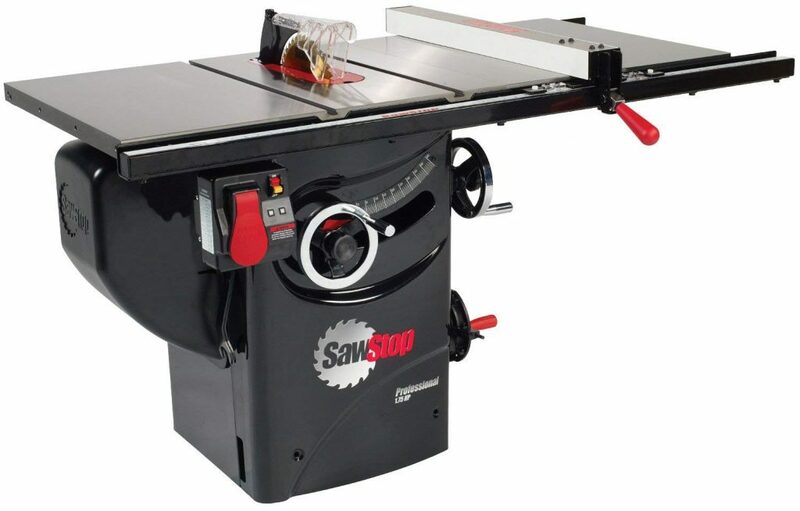 This is an extremely popular addition to your SawStop. The Inline Router Table consists of a cast-iron router table that attaches to either the left cast-iron wing or in place of the wooden extension table at the far right. I will be writing a detailed article about the different router table configurations and some of the considerations for each. 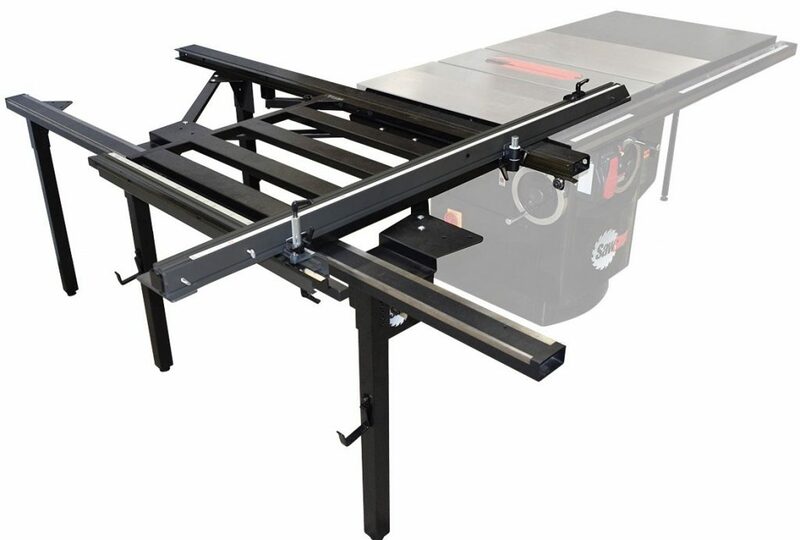 This addition is not compatible with either the Contractor Saw Mobile Base or the Professional Saw Integrated Mobile Base due to weight limitations. It works fine with the Industrial Mobile Base. It also is not compatible with the stamped steel wings that come stock on the CNS. If you have a CNS with cast-iron wings and don’t use a mobile base then there is no reason you can’t attach the inline router table to your saw. 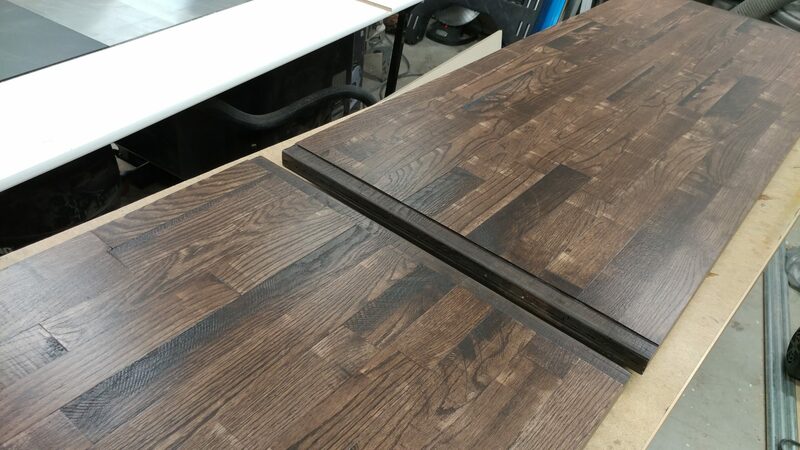 The Sliding Crosscut Table adds the ability to crosscut sheet-goods up to 48″ in width. It mounts either to the left wing or in place of it, which requires cutting down the front and rear rails and the front tube. I don’t consider this a replacement for a miter gauge or a sled, but, rather, yet another tool in your arsenal. 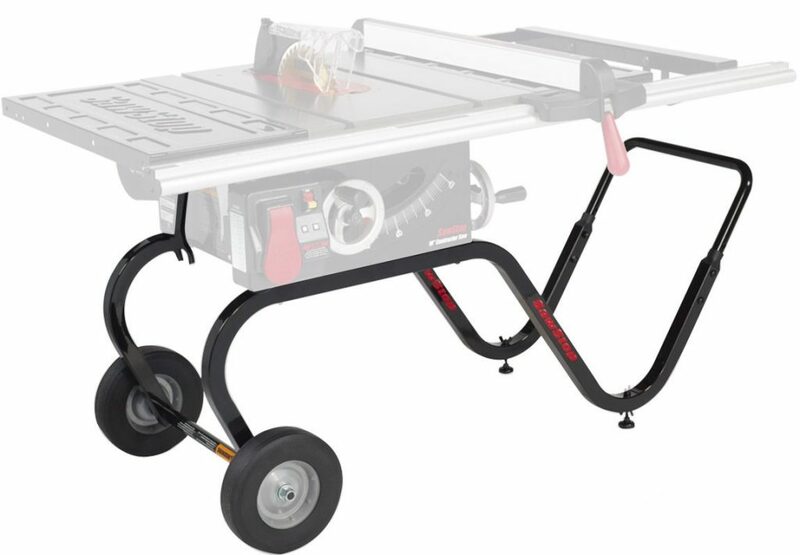 This addition is not compatible with either the Contractor Saw Mobile Base or the Professional Saw Integrated Mobile Base due to weight limitations. It works fine with the Industrial Mobile Base. 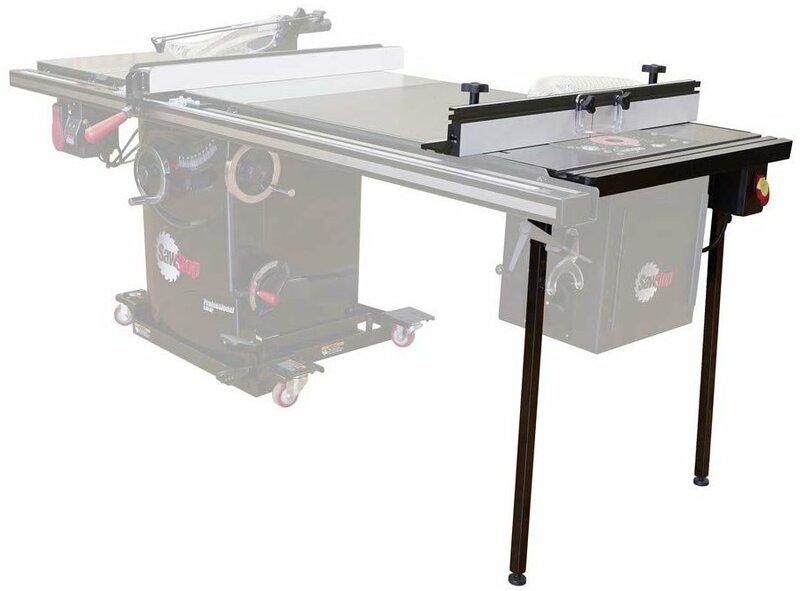 If you need to crosscut even larger sheet goods, the Large Sliding Table (TSA-SA70) has several configuration options which allow you to crosscut up to 70″ in width. This addition is not compatible with any mobile base. Whether you choose a Contractor Saw or a Professional Saw, I’m confident you will happy with your purchase. Hopefully what I have assembled for you here has helped you make a decision on which saw is right for you. I accept that it’s impossible to cover all considerations in this article. Still, that’s my goal. As such, if you have any other questions that I did not address, please leave them in the comments below and I will update this article.